At MWC, on Monday Samsung didn’t launch only devices. It launched also some interesting utilities. One is the enterprise security client, Samsung Knox 2.0. This new feature will be available on every handset that uses Android 4.4, but for Samsung Galaxy S5 it will have some different features. The features creates a two- factor biometric authentication system, which allows users to scan their fingerprint on the fingerprint sensor incorporated, and then they can enter the unlock code. Another feature is that Knox 2.0 lets you create two different containers: that can be used one for personal data and one for work data. Also the feature comes with a real-time scanner that is continuously checking Linux kernel for any malware infections. 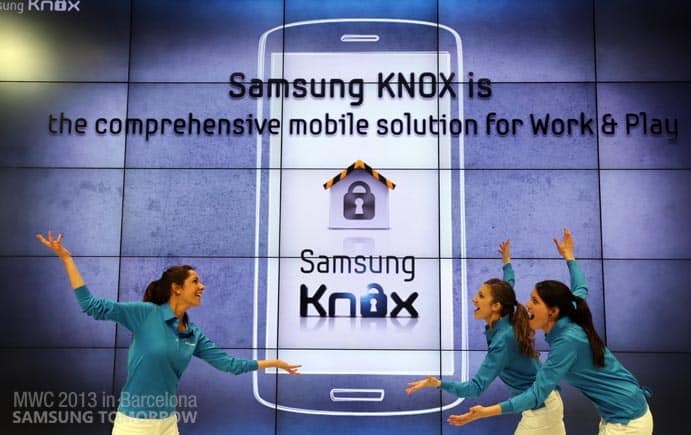 Samsung also launched Knox Marketplace, a store where enterprises can find and install Knox apps or other SaaS offerings. Enterprise Mobility Management was initially targeting small and medium businesses. EMM is a cloud-based admin console that gives access to IT managers to their devices, user identities or user access level. Knox 2.0 will be pre-installed on the new S5, but it can be downloaded on other Android 4.4 devices. it seems that there are at least 1 million Knox users in the world, a number that will increase this year.